We bought a Wii U at Christmas and have been loving it. I know as an 8th generation console is lacks the power and function of either the PS4 or the Xbox One. Truthfully for years Nintendo’s strategy made no sense to me at all. Then I got married and had children. We were only going to have one console for the foreseeable future and Nintendo because it was more affordable, and more kid friendly became the obvious choice. 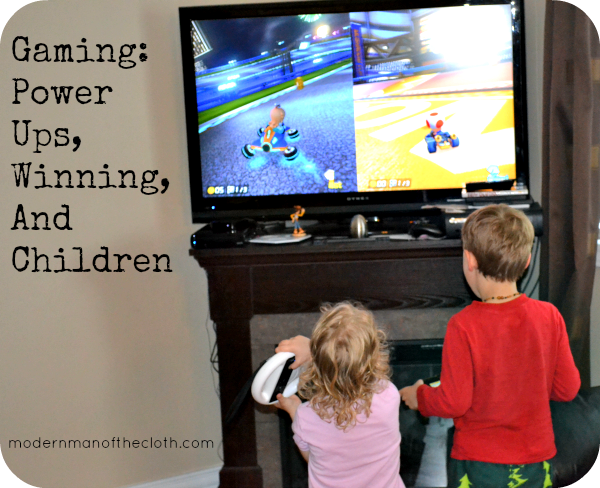 The two games that are currently dominating our living room are Super Mario 3D World (Kitty Cat Mario in our house) and Mario Kart 8 (Driving Mario 8 in our house). As we have been playing these games two wonderful characteristics about my kids have become readily apparent to me. Characteristics that I hope to preserve in them, and perhaps even rekindle in me. 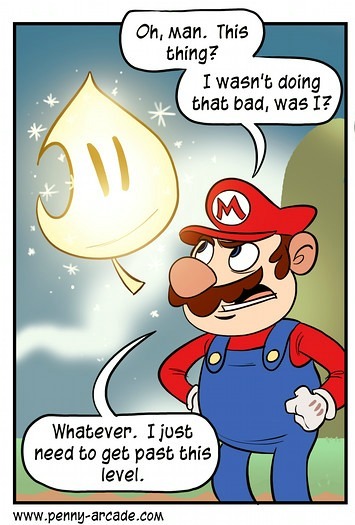 Mario has always been full of power ups. Leaves, flowers, stars, feathers, mushrooms and more all bestowed new powers that help you on your quest to save the ever kidnappable Princess Peach. For the record the leaf that gave you the ability to fly via your new racoon tail in Super Mario 3, and revived in New Super Mario Brothers 2 is my favourite. Simeon’s favourite power up is also a magical leaf. He likes the Invincibility Leaf. This power up pops up whenever you die too many times on the same level. Once you hit a certain number of failed attempts suddenly there glowing in the corner is a magical block that gives you this leaf which lets you jump further, jump higher, and makes you impervious to all damage. Penny Arcade captures my feelings about getting this power up pretty clearly. Simeon doesn’t see the leaf this way at all. He is happy to get the help. It occurs to me as I watch him play a level happy in his new ability he has not yet learned the lesson that many adults take to heart, getting help is for failures. I know I rarely like asking for help or admitting I am not sure of something. This has caused me more than my fair share of headaches and right now that is not a problem for Simeon. He gladly takes help me from, from Meghan, from friends, and from magical leaf dispensers. Perhaps I should as well. 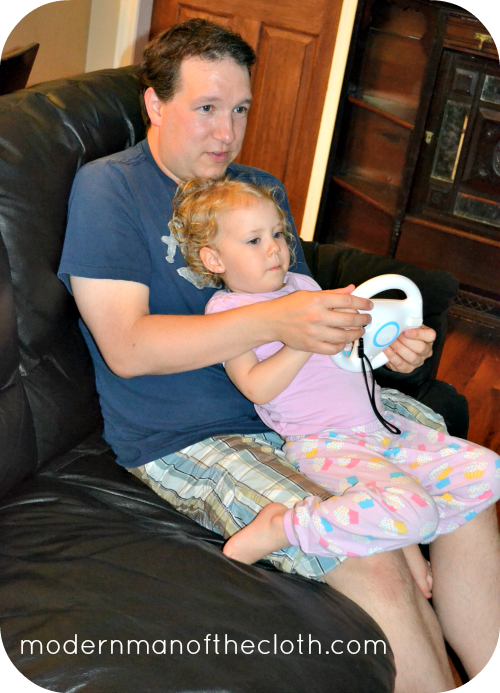 Playing Mario Kart is a family affair. For the first few go arounds Meghan, Simeon, Ariella, and myself all played. Neither Meghan or I showed any mercy to the children as we vied for first place. Simeon had gotten pretty good at the Mario Kart 7 for our 3DS’ so we wrongly assumed he wouldn’t have any issue with Mario Kart 8. But he had a hard time making the jump from the analog controls of the 3DS to the motion controls of the Wii U. He would finish the race eventually, but he wouldn’t beat anyone. Well he would beat once person, Ariella. Poor Ariella wanted to play so badly. And she was so excited to do so. But while all of the other cars whirled around the track tossing turtle shells at each other Ariella puttered along more often wedged against the wall then anywhere else. Time and time again after the three of us finished the race we would turn to see Ariella twisting and turning her wheel still working on lap 1/3. Despite always coming in 12th Ariella never lost a race. I wish I saw life the same way. I am always comparing myself to others. My looks/body shape, my parenting abilities, my cooking abilities, my pastoral abilities, and on and on I could go. I am always wondering if I am in first, second, last or lapped. But is that really the best way to live my life? Should I always be worrying about how I compare to other people? I don’t think so. If I know myself, and if I know what I want to achieve the only person I should compare myself to is me. Video games often get bad press about their effects on children. There are real concerns to address with screen time. But I also think games can be a fun tool for learning, and playing. In this case they helped to give me a glimpse into the inner workings of my children. I hope they will forever accept help when needed, and declare ‘I won’ whenever they cross a finish line. 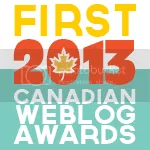 This entry was posted in Dad, Geek. Bookmark the permalink. This makes me want to go play videogames with Cameron (and Gavin?). I usually leave that for Dan to do with the kids. You should it is a nice experience.